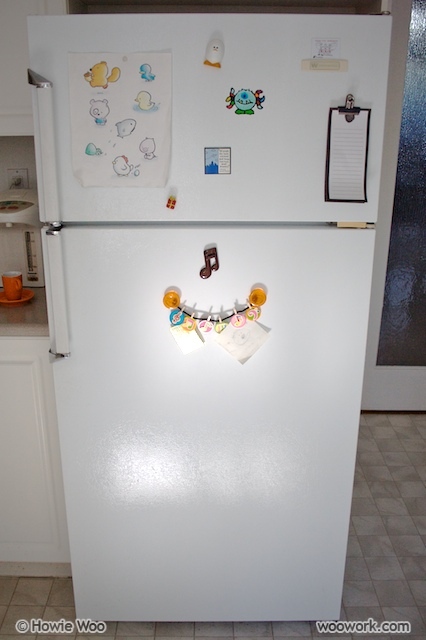 Each time I visit my fridge, I'm greeted by critters. 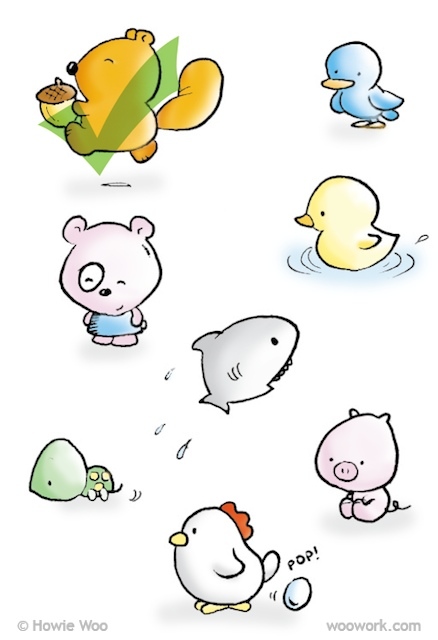 I drew these animals when I was learning to use a pen tablet, and digitally-coloured this scanned pencil sketch. 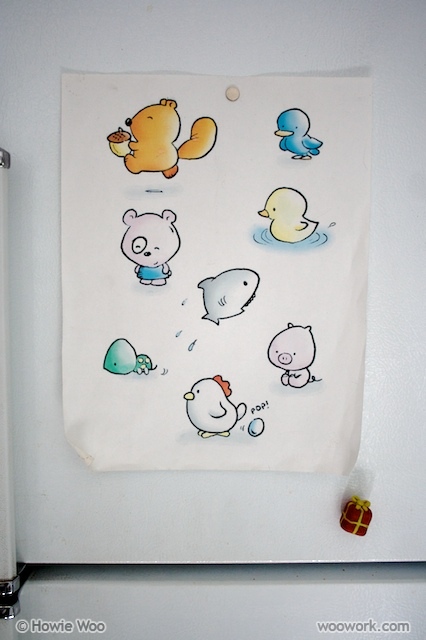 I printed the drawing and—because I wasn't blogging in 2001—posted these critters on my fridge eight years ago. One year ago, I was learning to use a crochet hook. 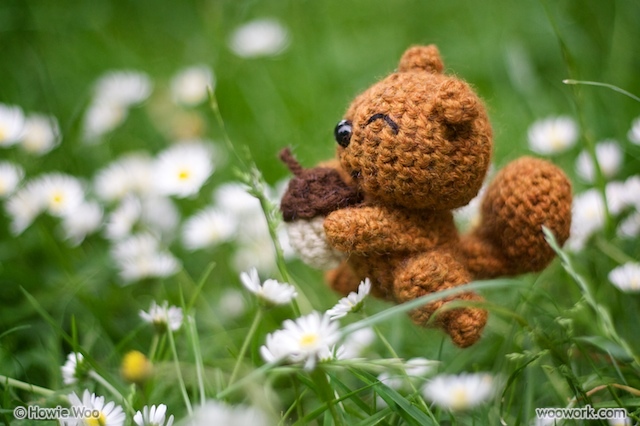 The thrill of learning to make amigurumi was like the thrill of learning to draw digitally. To marry these twin thrills, I'm remaking this 2D cartoon into 3D crochet. The first of eight Fridge Critters is a squirrel. His name is Squire. The remaining seven Fridge Critters will thaw as the new season approaches; a summer that is rich with the smell of acorn paste and the thrill of learning new things. He is the cutest thing ever!! I can't wait to see the others! that is adorable -- i love it! and how fun, to renew an old project. good luck with the rest of the bunch! How cute is that? I love it! OMG! That is so adorable I love it!!! Love this little guy! I just visited Yosemite this saturday and saw lots of squirrels. They would try to beg food off of the tourists. So cute! Squire turned out perfect! Sophy: Thanks :) I was initially hesitant to crochet these little animals, but they would call to me every time I went to the fridge! Renee': Thanks :) A trick to making adorable critters is to put their eyes low on their head and their nose close to their eyes! Rebekah: Both our weekends were full of squirrel sightings :D Yosemite must be squirrel-paradise. The real squirrel I encountered was super friendly too. He sat and waited for food while I crouched down to set up the photo! PaiseyJade: Wow, I'll pass on your declarations of love to Squire too :D Nice squirrels don't always finish last, it seems! He is absolutely amazing. Though I cannot wait to see how the wee piggie turns out! I love, love, love your creations! oh my gosh~ i'm totally jealous. how insanely precious!!!! You captured his personality wonderfully! That's a tricky transition from fridge art to crochet - I wonder who you'll do next? Oooooh! Trickery with that jumping pic! Love it, can't wait to see the rest! Louise: Thanks! It's fun to see those fridge critters as 3D objects after seeing them flat for so long :) I'm going to present the critters from left to right in each row, so it's the blue bird next! I just ran across your blog the other day . . TOTALLY lovin' it! You are so creative and funny to boot! Way to make crocheting cool again!! So sad that he's allergic to acorns. Good thing his allergy is not like standard human nut allergies. Otherwise the grinding of the paste for Gamma would be oh so deadly. He's very lucky to be a squirrel indeed! How would one make amiguri? I can knit and crochet... but alas.... nothing cute and fun as this. ollie: Yes, it's sad that he can't eat acorns, but his Gamma is grateful for his acorn-mashing service :D Before you mentioned it, I didn't know that peanut dust was so dangerous to humans with nut allergies! the squirrel is so adorable. Howie, u really never ever stop surprising me. It's always so much fun to read your blog. Thanks for making my day a more cheerful ones. Nesa: I'm so glad to hear that I can make your day more cheerful :) You made my day with your message, thanks! I can't believe how cute he is!! Squire is the most charming and heartwarming squirrel ever!!! I love his caring and charitable ways!! tadasrevolution: Yes, Squire is the only squirrel I know who collects acorns for other squirrels! I wonder if mommy squirrels do the same for their babies? 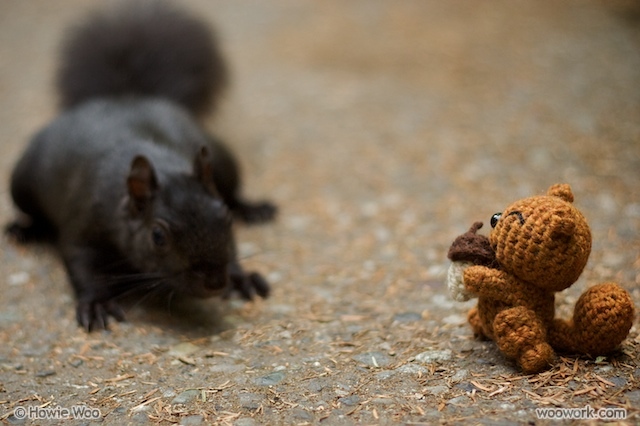 JenGoPop: I googled "black squirrel stanley park vancouver", and found out that black squirrels were introduced to this park around 1909 as a gift from the New York City Parks Department. They're spotted often in Vancouver, and I didn't know they were so rare until you mentioned it, thanks! I have never seen a black squirrel before this morning *grin* thank you for the introduction - yet another marvel of nature! Looks great! I do the same thing, but I sketch my animals before making them. I can't wait to see the rest of your animals!